Started my collection in 1969 after seeing another kid's collection when we visited to watch the Apollo 11 landing live. I had all the early ones and collected for a few years. Never thought they'd be so collectible, and passed them down to my nephews, who trashed them. Among other sets, I had the Hazard Hill Race Set, my favorite. Hot Wheels were awesome. A neighbor kid down the block from me had something called a "Juicer" - it looked like a small gasoline pump, but it ran on batteries. You'd plug the "Juicer" into certain Hot Wheels models to "fuel" them up and they'd run on their on. 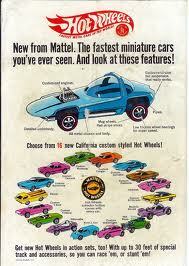 If you had cool Hot Wheels cars, you ruled.